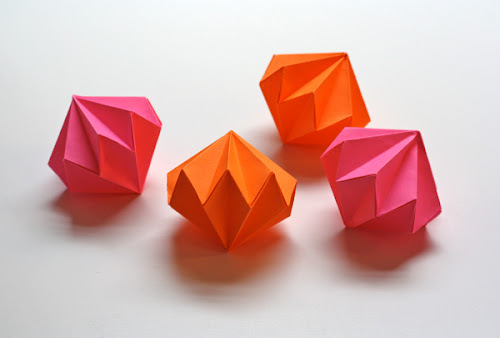 I tried out Emma's directions for how to make an origami diamond from two squares of paper. 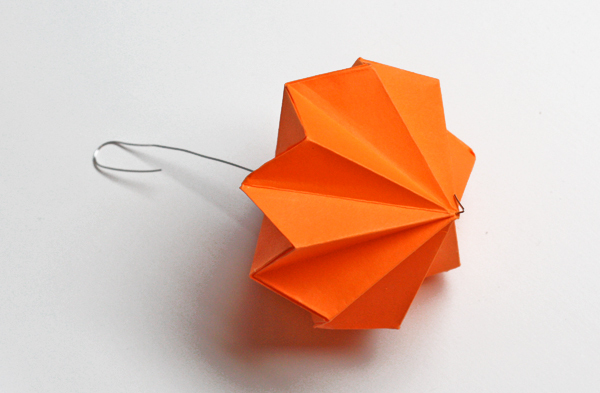 Each half is folded separately and then the two pieces are glued together. The folding was easy but the gluing was a challenge! Getting all the peaks and valleys aligned at once took some fiddling, but the result is really cute. After making these, I decided to hang them on our Christmas tree. I poked a hole in each end with a needle, then threaded a piece of wire through. I bent the bottom end of the wire into an acute angle so the gem won't slip off, then wrapped the top end of the wire over a pencil to form a hook. 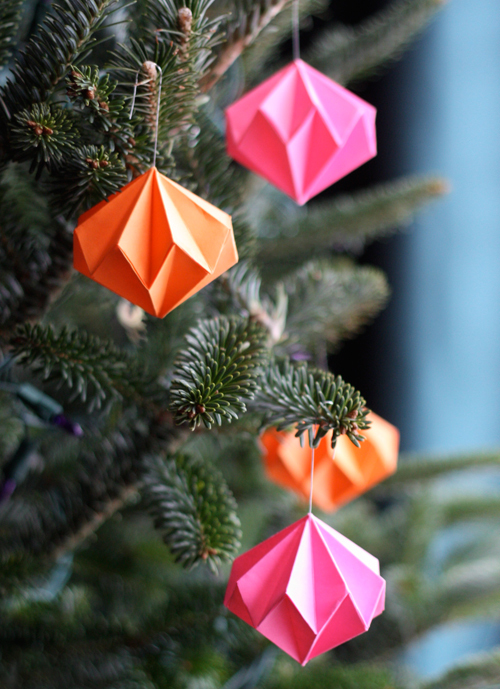 If you already know you're going to make these into ornaments, you could make your life easier by adding string or wire to the top half before gluing the diamond together. Or leave the hanger off and put them in a bowl on the coffee table. Find the tutorial here at Design and Form! These turned out so pretty, love your choice of colors. Cute! And the colors match your parlour decor! cute. i will have to send this to my nephew. he loves folding paper. I wonder if you could use these to cover string lights. That'd be so cute. You could also use different colors for different occasions, or patterned paper! Although it'd be a challenge to get the patterns to line up, likely. Or a patterned top and complementing solid bottom. There you go. Yes!! I bet if the pattern was a fairly small scale, nobody would even notice if it didn't match up. That's a fun idea! Love these ornaments ~ so beautiful!